One reason that solar energy has not been widely adopted is because light absorbing materials are not durable. Materials that harvest solar radiation for energy often overheat or degrade over time; this reduces their viability to compete with other renewable energy sources like wind or hydroelectric generators. A new video protocol addresses these issues by presenting a synthesis of two inorganic nanocrystals, each of which is more durable than their organic counterparts. The article, published in Journal of Visualized Experiments (JoVE), focuses on the liquid phase synthesis of two nanocrystals that produce hydrogen gas or an electric charge when exposed to light. "The main advantage of this technique is that it allows for direct, all inorganic coupling of the light absorber and the catalyst," says the leading author Dr. Mikhail Zamkov of Bowling Green State University. Zamkov's nanocrystals are unique for two reasons: they separate charge in different ways due to their architectures, and they are inorganic and durable. The first nanocrystal is rod-shaped, which allows the charge separation needed to produce hydrogen gas, a reaction known as photocatalysis. 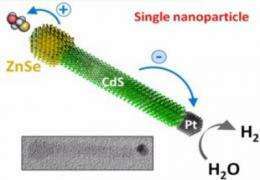 The second nanocrystal is composed of stacked layers and generates electricity, thus being photovoltaic. Because the nanocrystals are inorganic, they are easier to recharge and less sensitive to heat than their organic counterparts. Zamkov's inorganic photocatalytic material allows a rechargeable reaction when exposed to cheap organic solvents, whereas in traditional photocatalytic reactions the catalyst is often irreversibly degraded. The photovoltaic nanocrystals can also withstand higher heat than the traditional photovoltaic cells that do not dissipate heat well. "We have established a new method for making photocatalytic and photovoltaic materials. This is important primarily as a new strategy for making photovoltaic films that are 100% inorganic, thus producing a more stable solar panel. It is a design that you could reach marketability," Dr. Zamkov says. "It is important to have these steps documented in a video format, as the synthesis of the photocatalytic nanocrystals and the photovoltaic cells are long procedures with detailed steps. It makes our technique more visible and accessible." More information: Diederich, G., O'Connor, T., Moroz, P., Kinder, E., Kohn, E., Perera, D., et al. Harvesting Solar Energy by Means of Charge-Separating Nanocrystals and Their Solids. J. Vis. Exp. (66), e4296, DOI: 10.3791/4296 (2012). Sounded good until it got to that part. Long procedures and detailed steps aren't usually a thing for cheap manufacturing. I guess that's the next step.